I found this book to be one that I could easily give to a client. The author provided a basic background of retirement planning. The material is not overwhelming for the average reader. The subject of retirement planning focuses on retirement living expenses. This allows the reader to assess his/her current individual situation. By doing so, the reader is not frightened by complex terminology and complicated mathematical calculations. The author creates a reading environment that challenges the reader to think. Thinking about his/her own future lead to some very important questions. The book is divided in three parts. The first is titled, “How Much Money Will I Need to Retire?”. The second is, “Retirement Portfolio Management”. And, finally the third is, “Tax Planning in Retirement”. The first part is quite simple. It looks at the basic question of how much money does the reader think he/she needs to retire. Although the question appears simple enough the answer is a bit more complicated. The reader needs to review their expenses in retirement. A basic rule is to look at all the expenses that one has for an entire year. This will capture once a year expenses such as property taxes. Once expenses are calculated they also need to be adjusted for inflation. The author uses individual examples to illustrate his points. This allows the casual reader to review real-world examples that might be very similar to his/her situation. The issue of Social Security, pensions, and other incomes are discussed as sources of income for a retiree. Now specific planning strategies are not discussed because it is beyond the scope of the book. Although, there are multiple references listed that can assist someone that wishes to find more information on strategies. The Chapters end with a synopsis of the learning points listed as bullets. This allows for the reader to reinforce what he/she just read. Part Two of the book describes multiple savings vehicles such as 401Ks, IRAs, Index funds, ETF, active funds, stocks, and bonds. The advantages and disadvantages of using Index funds vs actively-managed funds are quite good. The reader is given the basics on what each one is and how they work. The focus is on the expense ratio of owning one or the other. I found the factors explained for rolling over an IRA to be helpful. A client will be asking more questions than there are answers in this book. This is good! A client will be able to seek out more information. This books sets up a blueprint to establish a plan. An individual plan will help everyone achieve their goals. The area of Asset Allocation is a valuable area because it helps the reader look at multiple sources of income bases on his/her timeline. The author describes three types of “buckets”. These buckets represent short-time or a “spending bucket”, mid-range or “intermediate bucket” and “long-term bucket”. The first is a spending bucket which can consist of money market accounts, saving accounts, etc. The need to have enough funds to cover a two year period of living expenses is critical. The intermediate bucket will have T-bills and short-term Treasury ETFs or Index Funds. This should be enough cash to cover a three year period of expenses. Finally, the rest of your portfolio should be allocated in stocks and bonds. The percentage ratio should be conservative to preserve wealth. This bucket should hold the bulk of your assets. As you use up your spending bucket you will use the assets in your other two buckets to replenish. This system will allow the retiree to move assets while minimizing the tax implications. Based on the size of the portfolio the author recommends a financial planner be consulted in establishing the individual buckets. This brings me to Part Three. This area covers tax planning. A retiree will need to know how to maintain enough assets in his/her retirement portfolio while considering the tax implications. Again, the author is only providing an overview. Individual planning is recommended with the aid of a qualified tax planner. However, the book does a good job of explaining tax-shelter bonds and Treasury Inflation-Protected Securities (TIPS). It also discusses Foreign Tax Credits that may affect some retirees. All of this is informative and can provide a retiree a sound foundation to engage his/her financial advisor. In closing, I found that this book does an effective job in setting the financial landscape to retiring. It by no means answers all of the specific questions that a particular retiree may have. This might not be appropriate for a more sophisticated client that has an established long-term plan with a sizeable estate. However this book does make it clear that everyone needs a plan to retire. A plan is just the first step, but it is by far the most important step to a successful future. 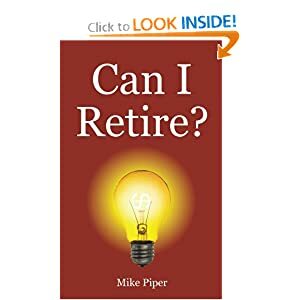 I would recommend this book to anyone that is just starting to consider his/her retirement. Put Your Accounts in Your Daughter’s Name — What Could Go Wrong?